The sharing economy market consists of companies which provide services to connect owners of an item with people who wish to use that item. In 2017, the revenue of platform providers in the global sharing economy amounted to 18.6 billion U.S. dollars. Furthermore, popularity of sharing economy services varies by country. As of April 2018, 47 percent of respondents in the United States reported that they have used sharing economy services. In 2022, it is expected that the Americas will account for 57.2 percent of the total revenue of the sharing economy market. The ride-hailing market is an important part of the sharing economy market. 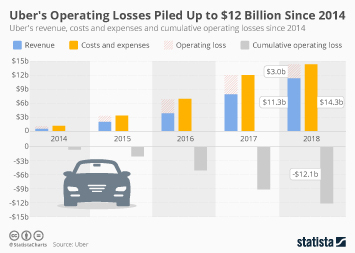 As of May 2018, Uber was the leading ride-hailing operator worldwide, with a market value of 72 billion U.S. dollars. Uber is an American peer-to-peer ridesharing and transportation network company headquartered in San Francisco, California. Founded in 2009, Uber has grown to become a prominent sharing economy services provider; boasting approximately 41.8 million users in the United States in March 2018. As of February 2018, Uber rideshare drivers accounted for 87.6 percent of the ride-hailing services market in the United States. In that same year, the average hourly earnings of rideshare drivers in the United States was 14.74 U.S. dollars for zero to 500 trips. In 2017, the transportation network company generated 7.5 billion U.S. dollars in net revenue worldwide. As of July 2017, the leading ridesharing company had received investments amounting to approximately 11.56 billion U.S. dollars. Uber’s gross booking volume has seen a year-on-year increase. In the second quarter of 2018, Uber generated gross bookings of 12 billion U.S. dollars worldwide. Popularity of Uber in the United States is at an all-time high. During a survey in May 2018, 76 percent of the respondents stated that they were familiar with ridesharing services provided by Uber. In general, familiarity of sharing economy services in the United States has seen a year-on-year growth. In 2018, 83 percent of respondents stated that they were familiar with at least one sharing economy service. Also, consumers recognize benefits they can accrue from using sharing economy services. During a survey in 2018, 60 percent of consumers in the United States stated that they recognize that sharing economy services can be cheaper for users. The ridesharing market in the U.S.